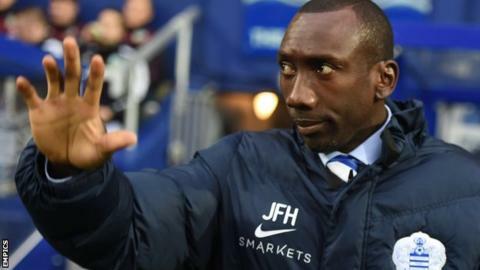 Jimmy Floyd Hasselbaink's first match as QPR manager ended in a goalless draw against Burnley at Loftus Road. Former Leeds, Chelsea and Netherlands striker Hasselbaink was appointed as Chris Ramsey's successor on 4 December. QPR, who were looking for a third successive victory, went close through Matt Phillips, James Perch and Leroy Fer in a promising first-half display. Defender Grant Hall's effort was cleared off the line by Burnley's Scott Arfield in stoppage time. Burnley, who have now gone five games without a win, improved after half time but could not break the deadlock. Sam Vokes sent two second-half headers off target as their disappointing run of results continued. That sequence has seen Sean Dyche's side slip down to fifth in the table and they are five points from an automatic promotion spot following their stalemate in west London. Hasselbaink, 43, left League One leaders Burton to take charge of QPR and watched an encouraging performance from his new side against a Burnley team that, like Rangers, were relegated from the Premier League last season. But the Championship's leading goalscorers at home in 2015-16 could not find a way past visiting goalkeeper Tom Heaton, despite the introduction of ex-Burnley forward Charlie Austin from the bench with an hour played. "I learned that we have a team that is willing to work for each other. There are a lot of positives and it's nice to see that the guys want to work and play football. "Players are going to make mistakes, but it's about expressing yourself and reacting when you do make mistakes. The players showed they want to do things right. "I am happy with how the game went. In the first half we played ever so well and were the better team." "A new manager usually gets a reaction and they've only lost once at home this season, so there were a lot of things in their favour. "For us to get on with our own game and play the way we did, I'm very pleased. "We thought they would look to press us, which they did. We thought they'd find it hard to keep that up for 95 minutes, which they did. We thought we'd get stronger as the game went on, which we did. "So I'm pleased with how it ended up going, apart from the fact that we didn't get the winner." Match ends, Queens Park Rangers 0, Burnley 0. Second Half ends, Queens Park Rangers 0, Burnley 0. Corner, Queens Park Rangers. Conceded by Tendayi Darikwa. Attempt blocked. Sandro (Queens Park Rangers) right footed shot from outside the box is blocked. Corner, Queens Park Rangers. Conceded by Michael Keane. Attempt missed. Sam Vokes (Burnley) header from the centre of the box misses to the right. Assisted by Ben Mee with a cross. Attempt blocked. Charlie Austin (Queens Park Rangers) right footed shot from more than 35 yards is blocked. Assisted by Leroy Fer with a headed pass. Attempt missed. Andre Gray (Burnley) right footed shot from outside the box is high and wide to the right. Assisted by Ben Mee. Attempt missed. Sam Vokes (Burnley) header from the centre of the box is close, but misses the top right corner. Assisted by Joey Barton. Corner, Burnley. Conceded by Paul Konchesky. Substitution, Queens Park Rangers. Jay Emmanuel-Thomas replaces Karl Henry. Attempt missed. Joey Barton (Burnley) right footed shot from outside the box is high and wide to the right. Corner, Burnley. Conceded by Leroy Fer. Foul by Sandro (Queens Park Rangers). Scott Arfield (Burnley) wins a free kick on the right wing. Attempt saved. Karl Henry (Queens Park Rangers) left footed shot from the centre of the box is saved in the centre of the goal. Assisted by Charlie Austin. Attempt missed. Scott Arfield (Burnley) right footed shot from outside the box is high and wide to the right. Assisted by Andre Gray. Corner, Burnley. Conceded by Nedum Onuoha. Attempt blocked. Scott Arfield (Burnley) right footed shot from the right side of the box is blocked. Assisted by Andre Gray. Attempt missed. Leroy Fer (Queens Park Rangers) header from the centre of the box misses to the left. Assisted by Alejandro Faurlin following a corner. Substitution, Queens Park Rangers. Charlie Austin replaces Junior Hoilett. Corner, Queens Park Rangers. Conceded by Michael Duff. Corner, Burnley. Conceded by Grant Hall. Attempt missed. Leroy Fer (Queens Park Rangers) header from the centre of the box misses to the left. Assisted by Karl Henry with a cross. Attempt blocked. Joey Barton (Burnley) right footed shot from outside the box is blocked. Offside, Burnley. Ben Mee tries a through ball, but Sam Vokes is caught offside. Second Half begins Queens Park Rangers 0, Burnley 0. First Half ends, Queens Park Rangers 0, Burnley 0.